Halter neck with snap closures. Single layer chiffon skirt attached. Attached chifon (or nylon) smooth and flowing skirt. Front panel criss cross ribbon. Velvet Lycra or nylon Lycra top with nylon Lycra or cotton Lycra bottom. Three layer triple length attached net skirt with ribbon binding finish. Spaghetti straps criss crossed at back. Attached skirt 19.5 inches (49cm) long at the front increasing to 28 inches (72cm) at the back in a Georgette material. Full circle long skirt attached. Slim waist and full circle knee length skirt. Chiffon cowl neck drape front and at the low back. Attached chiffon skirt a little longer at the back. Nylon Lycra leotard with a lace panel in the front. Attached single layer chiffon skirt longer at the back. Halter neck leoard tied at back. Attached three layer skirt in selected colour, black and glittering hologram Lycra. Fonteyn has a chiffon skirt attached to a nylon Lycra leotard with spaghetti straps criss crossed at the open back. Clear spaghetti straps from shoulder back. Flesh mesh Lycra panel in the front. Attached two layer chiffon fish tail skirt. Glittering silver Lycra top leotard. Attached silky nylon Lycra skirt. Attached calf length skirt (one layer) of smooth and flowing chiffon. Slightly flared attached skirt longer at the back. Lined mesh Lycra top with tiny silver coloured rhinestones. Attached chiffon.skirt lined to knee length. Attached chiffon skirt (2 layers). 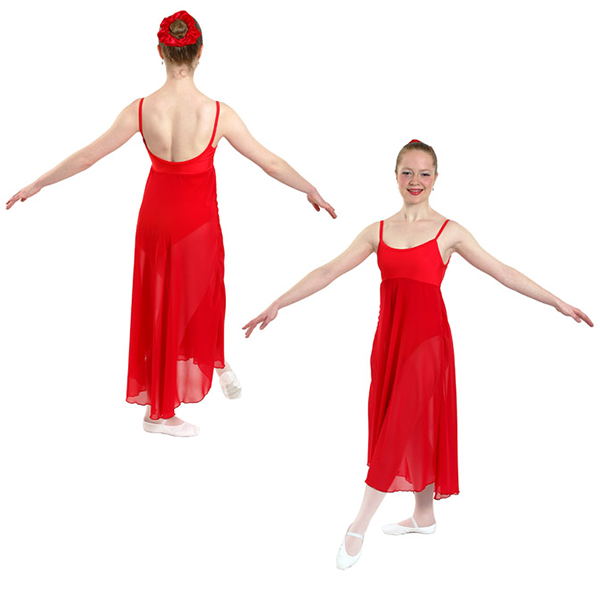 Ladies dance dresses are made to order in accordance with the size charts on this page.